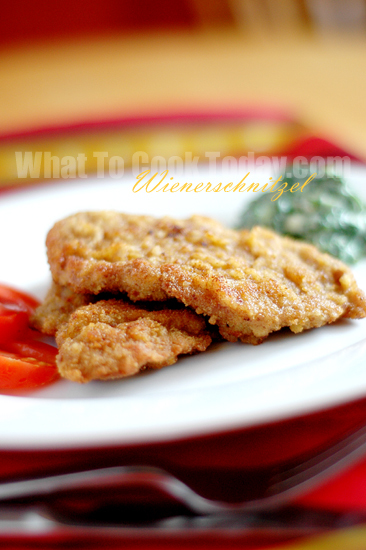 Learn how to make Vienna style tender and juicy Schnitzel with this easy no fuss recipe. According to Mimi Sheraton in her The German Cookbook, no single cut of meat is more beloved in Germany than the Schnitzel-literally a slice or cutlet, and always from the veal leg. It is the same long, flat, palm-shaped cut that the Italians call scallopini, and the French, escalope. The meat is cut with the long grain, or, more exactly, at a slightly diagonal to it, so that it does not fall apart when it is pounded. It is this pounding, done with a wooden mallet, that gives the Schnitzel its tenderness and delicacy. After being cut, the slice of veal is placed between several thicknesses of waxed paper and is then pounded to about 1/16″ to 1/8″ thickness. The butcher can best do this for you. If you ever have to do this yourself and no wooden mallet is around, sandwich each slice of veal between waxed paper, lay on a board and flatten with the bottom side of a dinner plate. Vienna’s Schnitzel is a standard menu all over the world and is just as popular in Germany as in its homeland, Austria. It was, by the way, the forerunner of northern Italy’s great specialty, Veal Cutlet Milanese. 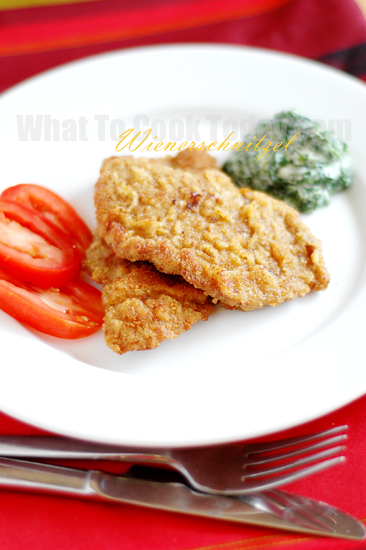 I love Milanese and Schnitzel is also another favorite of mine. All I have to say that you gotta try this recipe. It is quite amazing!